IMON ANHOLT, a British branding expert, spent a career developing international campaigns for Coca-Cola and Nestlé. Now he is trying to put his image-making skills to work for a very different kind of client: countries with struggling economies, like Croatia and Slovenia. "I was getting bored with spending my life making already rich companies a little bit richer," said Mr. Anholt, who is 43 and based in London. So, earlier this year, he opened his own agency, Placebrands, with one clear goal: to help countries develop themselves as brands, with a carefully managed international identity, as recognizable as any consumer product. He has worked with Germany, Britain and New Zealand, in addition to Croatia and Slovenia, and is now in negotiations with Mongolia. "When it comes to economic development, everyone talks about transportation, technology and civil service," Mr. Anholt said. "No one talks about marketing, which is bizarre. Marketing is at the heart of what makes rich countries rich." Mr. Anholt said he believed that helping countries develop and communicate strong brand identities could help speed up development by attracting foreign investors and tourists. That, in turn, could increase political influence and help a country's corporations grow. Mr. Anholt is not alone in seeing the possibilities in nation branding. The idea has been generating more interest in recent years as countries including the United States, Germany, France, Portugal, Estonia and Poland have brought in experts to help them tinker with their identities. Next year, Finland will start a campaign to enhance its image as a center of high-tech innovation, with the hope of helping its technology companies fare better in the United States. Branding is also seen as crucial to many Central European countries that have realized that their timelines for acceptance into the European Union, and their ability to compete against their neighbors for investment, depend in part on how they are perceived by more developed European countries like France and Germany. Changing the image of a country is no easier than changing the image of a company or an individual. While branding may be able to help a country improve its communication with the world, it won't work if the country sends out lies or hype, said Erich Joachimsthaler, chief executive of Vivaldi Partners, a four-year-old agency that specializes in branding. Mr. Joachimsthaler said that when working with Germany, he had run into a perception gap that is common in such work. His German clients wanted to portray themselves as a passionate, emotional, flexible people, an image that he said was "a whole bunch of baloney." Charlotte Beers, the former chief executive of the advertising agency Ogilvy & Mather, served for a year and a half as President Bush's under secretary of state for public diplomacy and public affairs - and part of the job was the task of selling America to the Middle East. Jennifer L. Aaker, an associate professor of marketing at Stanford's Graduate School of Business, said that task was almost impossible. "One of the reasons that effort failed was because of the underlying product - our policies were not perceived as pro-Middle East. We failed to understand the media, the culture, even the language in that region. It is difficult to garner favorable perceptions of the American brand in that context." While most countries have complicated identities, Croatia, one of Mr. Anholt's clients, is a particularly vexing case. To the extent that people in Western Europe think of the country at all, they associate it with Nazi complicity in World War II, Mr. Anholt said, or with the bloody conflicts in the 1990's between the Serbs and the Croats. Stjepo Martinovic, editor of Croatia's national heritage magazine, Matica, and a former adviser to the Croatian government on European integration, said that because Croatia is scheduled to join the European Union as early as 2007, it was particularly important that the country project a positive image. "We are trying to present Croatia as a normal country, a market economy, a democratic society, a Mediterranean country," Mr. Martinovic said. He argues that Croatia can be made attractive to the rest of the world by letting people know about its inexpensive work force, its livable cities and its schools that offer classes in English - as well as its ballet, theater and contemporary artists. Mr. Anholt's job is to assess these qualities, understand what outsiders may think about the country and then work to coordinate the messages from various ministries, private industry, cultural institutions and even sports teams. But Croatia cannot focus only on its assets and pretend that there are no negative associations, Mr. Anholt said. He is in the early stages of his work for Croatia but has come up with a one-liner for the country: "We're trying hard and developing quickly." Slovenia, another country that Mr. Anholt has advised, presents a different set of problems. The country is small, largely unknown and often confused with Slovakia. "We're a country that recently got its independence,'' said Rok Klancnik, the former director of communications for Slovenia's tourism board and now the director of communications at the World Tourism Organization in Madrid. "We're striving to reach higher levels of economic, social and cultural development. Branding is not only useful, it's necessary." For Slovenia, sending musicians and artists abroad is one way to communicate. If someone enjoys a performance of the Ljubljana Symphony Orchestra in, say, Chicago, that will reflect well on Slovenia, Mr. Anholt said, and may encourage people to visit it or buy its products. Because he regards branding as something that can take 10 or 20 years to achieve, Mr. Anholt does not recommend advertising as a solution. In the case of Slovenia, he argues that schools there should teach English, Italian and German. In 15 years, when some of those students are working in hotels and can greet visitors in their native languages, those visitors will be more likely to leave with a positive impression of the country. Wally Olins, a visiting fellow at the Saďd Business School at Oxford University and a founder of the branding firm Wolff-Olins, said a country's brand involved messages from dozens of agencies and private companies. Everything from its Web site design and trade show materials to its stance on complex issues like international trade agreements can give clues about a country's identity. For example, Mexico's decision to sign the North American Free Trade Agreement did more to signal its readiness for foreign investment than any other single event could have, according to Robert Z. Lawrence, a professor of international trade and investment at the Kennedy School of Government at Harvard. Similarly, Mr. Anholt said, Slovenia's generosity in foreign aid - it is a donor to countries in its region - sends the message that the country is both stable and economically prosperous. WORKING with countries can be exasperating. Corporations have top-down structures that require employees to get behind new projects and often have chief executives with long tenures. Nations have political factions, sudden leadership changes and vast bureaucracies. Branding programs may be seen as superfluous. Advertising firms and corporations may have different goals than government agencies. Mr. Anholt said he had started and stopped work with Slovenia many times. "Every time I get involved, I make friends, create a good impression, some of my advice is taken, some is not, and then I have to start all over again," he said. Whether branding is as useful as Mr. Anholt believes, however, is the subject of some debate, at least if the goal is to help a country's corporations expand internationally. Many branding experts point to the success of Japan and Japanese corporations as an example of how national and corporate identities can benefit each other. After World War II, Japan became associated with poor-quality products, but in the 1980's, with the emergence of successful Japanese corporations like Toyota and Sony and Honda, the name Japan became synonymous with quality and technology. But to think that Mr. Anholt's branding efforts can do the same for Slovenia's companies may be wishful thinking, said Desmond Lachman, an economist and resident fellow at the American Enterprise Institute, a conservative research organization. Japan had high regulatory standards and a relatively large domestic market that helped its corporations develop, Mr. Lachman said. Slovenia, on the other hand, has a tiny domestic market. It will not become another Japan no matter how it is branded, he said. The most efficient way for Eastern European countries with emerging economies to promote growth is to pursue policies that encourage investment from companies in France, Germany and other European Union countries to help develop a manufacturing base, Mr. Lachman said. Although Mr. Anholt says a better international image can have long-term international benefits, he does not argue that it's the right thing for every country. "Money should not be taken away from essential nation-building activity to do branding," he said. "If the roads need fixing, they are probably better off using their money to fix the roads." 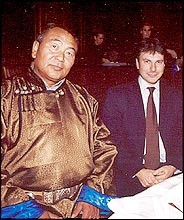 Simon Anholt of Placebrands, with representatives of Mongolia at a dinner in London this month. Placebrands helps countries manage their images.